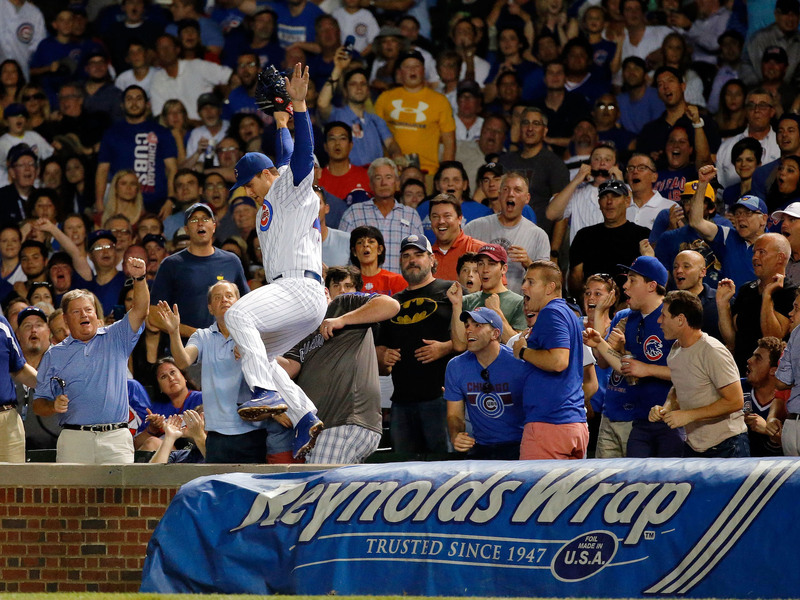 After a spectacular catch by first baseman Anthony Rizzo, Cubs fans reacted appropriately. Cubs first baseman Anthony Rizzo made an incredible grab on Tuesday night, climbing a wall in foul territory, standing on top of it and reaching into the stands to record an out. The dude in the Batman shirt isn’t totally sure how to react. The fan in the blue shirt and Cubs hat in the bottom right is beside himself, while the woman slightly to his left seems to be in shock. The young fan in the mustard-color UnderArmour shirt seems to be experiencing an amazing catch for the first time, and is unfazed by the guy selling beer in front of him. Meanwhile, the guy with the tucked in shirt in the bottom left is giving Rizzo’s catch the dad fist pump of the year, all while the man in the blue-and-white plaid shirt a couple rows up from Batman deeply contemplates life while disregarding the catch altogether. It’s been that kind of year for the Cubs, who may actually win the [attacked by man who believes in curses and jinxes].